Me, too, Diann! And if we were finished eating before the lunch break was over, we could go outside and play then, too. I was shocked to learn how little recess kids get now! I lived in California, and we got at least one recess in the morning, lunchtime, and afternoon. When we went home, I don’t recall us being as knackered as my kids were. I had lunch from home – everyday there was a sandwich with bologna (cold cut, ugh!) and 1 slice of cheddar cheese plus an apple and a bottle of water….sometimes I had an apple and a yogurt for snack. And that great outside time…no difficulty sitting still…also, people were not so quick to demand that children sit still. Does anybody feel children are being asked to behave like adults? Yes. It’s absolutely ridiculous. A teacher at my child’s school benches children AT RECESS who are fidgety. Talk about being the architect of your own demise. I mean, are you kidding me, lady? Awful and out of touch woman. I agree with you in so far as elementary level kids. BUT part of the problem in upper levels is we continue to try to use the same paradigm for young adults. That’s why people like the “Lakeland shooter” keep getting a break,”cause they’re just kids” Starting in junior high we need to begin instilling good study habits and requiring more adult behavior. https://www.washingtonpost.com/news/answer-sheet/wp/2015/09/01/the-decline-of-play-in-preschoolers-and-the-rise-in-sensory-issues/ makes it seem like children are being asked to behave like autistic savants even if they don’t have autism. I can not believe the short lunch time they have to eat. No relaxation just hurry, stand in line, eat, throw away what you cant eat and get back to class. Apparently some schools don’t even have a period just for lunch, they have a combined lunch + recess period so there’s also kids eating in a hurry in order to have time to play. It’s better to have separate times for lunch and recess in the schedule, even if one comes right after the other. Our district put the fifth graders in a middle school model, with seven periods! Just 3 minutes passing time between classes, 30 minutes total for lunch, and they need to walk up to another building to eat. No lunch recess, no morning or afternoon recess. We had kids suspended for behavior last year…..never saw this when they had time to “play” outside! I grew up in AZ and was thinking I wasn’t remembering things correctly, but I think we got 3 as well (if you included lunch). My daughter gets one 20-min recess and a lot of it is structured. I usually give her 30-45 after school of free, unstructured time to play w friends. The world is different now. Tons more of over stimulation. Maybe in the past, time after school and in the evening was a sufficient time to recharge. Not anymore. We also walked to and from school. Uphill both ways and in the snow barefoot? I think “a friend” was just saying that kids are driven to school now more than walking. Walking was a way to burn off some energy. I would have to agree. IT does make a difference, getting some of that energy out at the start of the day. We are lucky enough to live walking distance from the school (about 1/4 of a mile.) In the warmer weather, when there was time, our son delighted in walking or riding his bike. At the very least, if we aren’t walking, we’ve tried to get there ahead of time so he can spend 10 or 15 minutes on the playground before going in. Yes. These children are full of energy which needs to be expelled. @ Mary, I suggest you copy and show this article to the teacher you mention, or perhaps speak to her head teacher and bring this to his attention, if she is not approachable. Many teachers are just struggling with large numbers of pupils, targets, tests and looking for solutions. As a teacher I would have considered suggestions put to me for problematic behaviour. Put tactfully, not as a criticism, but “Look, I found this article advocating extra unstructured play to deal with disruptive behaviour, would you like to borrow it?” just might provide a happy outcome. The problem is it isn’t up to the individual teacher. I talked to a teacher who was substituting(not long term)in a class and she was told no recesses but she gave the kids a “whopping” ten minutes twice a day anyhow. She was told she would never be asked to be a substitute again. No warnings, no admonishments, no benefit of the doubt that she misunderstood, nothing, that was it she was done. Those “experts” making policy don’t have a clue when it comes to what kids need. All they want is to make them into little automatons who’ll do what they’re told and what field of work would be good for them to enter for the benefit of society…..not for their benefit nor what they would like to do in life. Yes, Dianne, and we had an hour at lunch, much of which was spent on the playground. I tutor kindergarteners and first graders. It is senseless that: 1) kindergarteners go to school all day; They do not get any quiet, rest time; And They are required to be focused and working every minute and on task every minute . They are just little kids and they get so tired and often tearful. I would forward this article to our national Secretary of Education but, she is incapable of understanding or implementing anything like this. All she is focusing on is destroying our public school system and enriching big companies who run private charter schools. Many devices have a “reading view” option that eliminates the ads. If you are using chrome, there is an extension in the chrome webstore that you can get that will let you get it without all the ads. I’m on my phone right now, or I would screenshot it for you. Once upon a time, when before I converted from Mac, I believe you could go up to the right of the omnibox and click on reader and it would convert to a printer friendly version for you. Try copying the entire thing into a word document, then you can delete pictures, ads, anything you don’t want to include in your print. You can also hold the left mouse button to highlight the text, right click the highlighted text to copy, and past the copy onto a document window such as your mail compose window, edit anything out and save/print it from there. download AdBlockPlus, there are different versions for chrome, IE, firefox, etc Here is what I have been saved from looking at so far…. That would be nice. A printable without the ads. What about the Government’s rules for minimum hours of instruction per School Year? It’s only 4-15 minute blocks. It probably cuts down on wasted time in other areas. There are ways around wording it in the schedule, anyway. This is the K/1 level. One or two of the blocks might be called recess, but they may be able to call the other blocks social skills development, gross motor skills, or even gross motor/social skills integration. As a former K teacher, no, don’t do that. Make those ideas the lesson. Let children think up there own ideas and even become bored. It is good for the brain. That’s a good idea because recess is agony for children who are bullied or left out. Unstructured could be an option to activity to provide purpose. Thats learning life. If they are bullied on the playground, they are bullied anywhere!!! Defeats the whole purpose. Teaches kids they aren’t smart enough to be self-directed. They’ll learn more when they solve/get answers to “their” questions. In Washington state, recess is included in the instructional hours. The only time not included is lunch. Make some of the time structured play/learning for part of the instruction period and then turn them loose for unstructured play. . . Excellent, but let’s expand to all students, beyond first grade. I hope this gets publicized and all schools all over America implement this. Jimboylan, we’ve found that kids who have enough opportunity to run and get the wiggles out use their instructional time much more efficiently. Because they’re not distracted by pent-up energy, they’re able to focus better and learn more in less time. This doesn’t just apply to kids. I am a building contractor and give my guys a fifteen minutes break every hour. We get way more done in a day because the guys aren’t always working fatigued. I’m retired and, even when working, never worked in the trades. But I’ve done A LOT of work in and to my house, so I have an inkling how hard your guys (and gals) work. The work world needs more bosses like you. The school where I work our hours are 9:20-3:50 with 3 fifteen minute recess. This particular story has been repeated a million times and it really bugs me. I student taught at that school. It is a VERY nice school but what they don’t tell you is that it is a school in a VERY wealthy area and that they have ALWAYS done it this way. They have a huge, fabulous playground which has plenty of space and equipment to handle several grade levels at a time. Their PTA raises about $30,000 at each fundraiser so they have plenty of money to put into it. They have very few students with ADHD or other major behavior problems. They have TONS of serious food allergies though. The parents are super involved in their kids lives and in the school. It does not compare in any way shape or form to the Title I School I teach at a few miles down the road. The pictures posted are usually stock photos of Title I schools. That have very diverse populations. This school also has very little technology. I think that has even more to do with the lower incidence of ADHD than the extra play time. I’ll get off my soapbox now. Thanks so much for telling us the whole story. But the article from the Today show over a year ago says it was implemented in four schools in the area, and shows pictures that are specifically identified as being of students at a particular participating school. Also, the points you raise in your comment seem not to go with the article. If they have always done it this way, then why are they seeing a difference? And it doesn’t sound like the point was the size of the playground or the equipment in it, but just getting kids out at certain intervals to run around in an unstructured way. And are you saying that the lack of technology in the Title I school raises the ADHD rate? Is there science to back that up? when I was a kid we had a set of swings, a slipper slide and a merry go around. that was for the first six grades to use. we made do and made our games so we had a good play time at recess. The person blaming all the money and equipment for the success rate is completely wrong.. The world needs to quit blaming everything on having money. I get it. Flip side of that coin is that maybe they have very few kids with behavioral problems because they’ve always done it this way? Sounds like this is one school of a dozen in the study. Research already supports 10 minutes of activity each hour increasing “on task” behavior by 8-20% in all children regardless of the presence of ADHD or other diagnoses. I also taught in a title 1 school in the “projects”. Our school didn’t have a lot of fancy resources. However, we did have exercise time built into our school day. The Principal allowed us to decide when the kids needed stretch break and outside “walks”. We did not have any recess equipment. We found out that our kids were much m ore interested in what any of us were saying if they had several 15 min. breaks to breathe and stretch and jump and play Red Rover etc. ( we had some green area next to the walkway to the side of our building. Our kids improved in their reading, listening and mathematical computations quite a bit. So, don’t think that this study is because the kids were “advantaged” It just is a means of creativity on the part of the teachers, staff and principals. We had a semi-diverse population, but they were all from academically low resources. We worked very hard to include extra enrichments. Often out of our own pockets, grant and charity gifts, we provided extra care, social skills and RAK. (random acts of kindness). Our RAK provided the “social studies practice and discouraged bullyness. We don’t have much where I work. The kids run most of the time and play chasing games. We don’t have much time for recess. On days we can sneak in more time, my kids are more relaxed coming in and are able to focus more. On days we have a short recess they come in hyper, fighting and unable to pay attention for a long period of time. It doesn’t matter if it’s a wealthy school or not. Students still need the extra recess time. hey. don’t anyone believe that this is some kind of “new” breakthrough. Many of us in the field have known for years that all students need movement and free play. I’ll be happy to see this commitment to children and free play grow, and the problems we are facing are mostly of our own cause when it comes to things like removing recess and removing gym time, etc. Children need free play time for full brain growth. Movement is life. Sitting behind desks, especially in the early years, is not normal and does not promote brain growth. This is a great program, but ADHD is not something that goes away with more playtime. Many kids with ADHD need meds, no matter how much breakout time they get. However, it’s possible they may not need doses as high and that some may not need meds at all with the right environmental interventions, or at least not until they’re older. THANK YOU! My diagnosed ADHD son was slowed down only by prescribed Amphetamine. Played hell with his appetite and he got cranky, but it did slow him down. However, now 61, he still misjudges space and, well, I am ADD and when we cannot CONceieve spacial relationship as we PERceieve it…the results are maddening as well as painful. The 100% correct book “You Mean I’m Not Lazy, Stupid or Crazy?” should be memorized by all parents & MANDATORY before any sort of teaching credential is awarded!! And the award-winning “ADD and Loving It?” is critical to one’s understanding of this affliction! Your son is 61? How old was he when he was diagnosed?. What do you mean he misjudges space? What is spacial relationship? I know this is article is a few months old now, but I’m glad you mentioned spacial relationships. You’re one of the few people I’ve ever known to talk about this particular, incredibly irritating, phenomenon. When I’m not on meds I cannot judge spacial distances and find myself ducking out of the way of things that are nowhere near me. I and my 8 year old have ADHD. Exercise helps but it doesn’t “cure” ADHD unless the children were misdiagnosed due to restlessness. Yes! On the spacial relationships! I have twin sons, both with ADD. They are now 22 years old, but I have noticed the spacial thing all of their lives. They don’t seem to have a concept of their own “space”and the “space” of others. It seems to go along with the slower social development that is common with ADD kids. Tom you are so right. My 7 year old granddaughter has ADHD. We knew it for years. Finally one doctor confirmed what we already knew. He said he had never seen a child so young with it. Last year her teacher told my daughter she might want to have her tested for Autism. The results were that she did have it. She has high functioning Autism. In addition to her meds she has therapy 3 times a week for 2 hours each day. She also started horse therapy once a week. She loves it. Thing is, while extra playtime doesn’t cure ADHD, it can help the kids who have borderline cases, and it can help keep kids who are just naturally high energy from being misdiagnosed just because they always have the fidgets due to lack of activity that helps them burn off that energy. When I started school (way back in the olden days – 1954) first graders started at 9:00, had recess, left for lunch at 11:00 (walked home), came back at 1:00, had recess, and got out at 3:00. Older grades had longer schedules. Country kids still went to country schools. No kindergarten, you started at age 6. We played hard even in deep snow. No talking or moving around in class. Most of us learned. We all learned to behave. My granddaughter attends an Eagle Mountain Saginaw elementary that employs this strategy. Much more to the “program” than additional recess. It’s good to see schools willing to venture out and try tested strategies. As an OT we have suggested this for years. Sadly many of the first round of children given drugs for adhd are now self medicating with street drugs and are addicts or worse, dead from overdoses. Play and movement are necessary for successful learning. Thank you! For a voice of reason!!! Anne Coppersmith it is very sad. See my reply to Tom (Nov. 24, 2017). Children with ADHD also need therapy. Some people with depression also need therapy in addition to the meds. I speak from experience. Years ago I was in a outpatient program with a small group and therapist for 2 weeks. Then group therapy every week. Also did some individual therapy. Just taking meds doesn’t always work. YES!!! Please….Get the kids off artificial food dyes. Less wheat. ADHD is a side affect of these ingredients…..
ADHD is not related to any ingredients. ADHD is a disorder of metabolism of the brain. My 3 Kids and I have ADHD. If it’s a reaction to ingredients it’s NOT ADHD even if it has the same behavioral symptoms. Is this a personal conclusion or do you have valid testing facts and information on the ADHD subject. ADHD is a autism spectrum disorder to my understanding. The artificial dyes can make the ADHD worse but it’s not the cause. The wheat thing? It’s only been in recent years that wheat has become an issue. Hundred of years prior, not so much? Actually, studies have shown that NOT treating children with ADHD (meds, therapy, support) is what increases their likleyhood of turning to drugs when older. ADHD meds DO NOT turn kids into junkies, ADHD meds are NOT meth, and ADHD meds are a wonderful tool in the ADHD treatment arsinal. Stop spreding stigma that keeps kids and adukts from treatments that save their lives. Thank You, Karst! My son has severe ADHD and HFA. I have ADHD as well but was undiagnosed until I was an adult. Medications made a world of difference in my life as well as my sons. ADHD brains do not get a ‘high’ from stimulant medications like a non ADHD brain does. I self medicated with street drugs for many years. Luckily I was able to overcome that addiction and found therapy and medication that saved my life. Most drug addicts are probably mis or undiagnosed like I was who are themselves self medicating with street drugs. Fabulous article. All children should have a chance in trying this. Finland utilizes this & children there have very high marks in math, science etc. What more do you need to know. It’s proven. Let’s give our kids in Canada the chance to learn from the best. We switched our kindergartner from a school that got one 20 minute recess, to a school with 2 unstructured recesses exactly for this reason. My son is doing amazing and thriving. Although I agree that increased recess/physical activity time would hugely benefit all children’s ability to focus and learn in school, I hate the way this article presents ADHD as pretty much just meaning fidgety kids. ADHD is a diagnosable disability in executive functioning which includes attention and regulation. Increased physical activity doe not reduce or cure ADHD. Rather it is one strategy to help children manage their ADHD symptoms such as inattention or fidgetiness, just as a ramp is a strategy to help a person in a wheel chair get around. I think it does a real disservice to our ADHD kids to present this disability as simply under stimulated/overly fidgety kids that can “fixed” by adding more recess or free time or whatever. In fact it makes me quite angry that this kind of misinformation is being spread. It is a reaction, an allergy, to artificial food dye. Take out all (especially red) food dye, for several weeks. See what happens. My children are 9 and 11. It has been a journey! Good Luck. I keep coming across your comments. ADHD isn’t always the result of red dye. My son was diagnosed when he was around 5. He is a selective eater. His diet had zero red dye. This the story for your kids. It was an allergy to red dye. My son has ADHD and anxiety that has nothing to do with his diet. You are discouraging people from getting real help. And you agree that kids on meds are going to turn into junkies?! What’s wrong with you, Sharil?? Thanks, Kelly. ADHD also tends to run in families and doesn’t look the same for every kid. My mom went full 1970’s food co-op granola earth mother natural everything to try to help my brother regulate the hyperactive side of his ADHD with very little success. I was diagnosed at 44 with ADHD innattentive sub-type, which finally gave me an explanation for missing or poor executive function skills that most people take for granted. I was on the same diet as my brother – the whole family was – and I still had a missing internal clock, poor working memory, zero ability to break assignments into manageable tasks or prioritize, and an inability to stay organized. However, because I wasn’t a “problem” at school and my intellectual ability masked my deficits, no one noticed. My brother has actually managed to create a much more successful professional life for himself with much less anxiety and depression involved, despite the fact that a totally natural diet did not “cure” his ADHD, in large part because we all knew what he was battling. I agree that there are food additives that cause ADHD-like symptoms, and the red dye you speak of is one of those. It’s actually illegal to use that particular additive here in Germany, where I currently live, and I know several American kids who can eat any candy made here in Germany and almost none made in the US. But Sharil, you need to stop assuming that all ADHD-like symptoms have the same cause. The fact that it is true for some does not mean it’s true for all. It just means that we need our doctors and school systems to take more time and do more thorough, more professional evaluations before any diagnoses or labels are applied. Exactly. Your story could be my own, Chrysta. And this article is irksome the way it presents ADHD. There’s a lot more to ADHD than just hyper activity. I really wish the medical community would change the name to better reflect the actual problem. It’s not a reaction to artificial food. That‘s a myth. ADHD is a disorder of the metabolism of the brain and not in any way related to food. Well said. Extra recess will certainly help kids with ADHD but this articles completely minimizes all the challenges of a neurological disorder. ADHD is already misunderstood by many, and this article only adds to the confusion. My daughter has lots of Sensory Processing issues and ADHD. I now homeschool her. We do 45 min. To 1 hour of work and a 5-10 min. of outside activities. It definitely helps. It keeps her feeling awake, focused and just better. I acknowledge that we have that flexibility and if we need more time we work longer in the day. It definitely helps. ALL kids need more gym time and recess. I also worked in a public elementary school before I made the choice to homeschool. My son still attends public school. Schools cut recess to accommodate requirements or schedules. It is a shame. Kids need to move! Not all kids. When we started homeschooling our eldest we used a 40 min period per subject. He hated it. He wanted 2 hrs per subject so he could follow thoughts and ideas to completion. Granted he was unusual but my memories of recess are also not great. About time they throw away that old albatross of a way of thinking. It’s just the same as when they used to force left-handed kids to be right-handed, for Gosh sakes. Especially for ADHD kids who just need to let off some steam a bit more often than others. If it works the government will squash it! They want brain dead obedient people pumping out of the public school system. This article presents a good picture of a strategy which may be useful for children on the hyperactivity end of the ADD/ADHD spectrum. But what about the kids (or adults) who are on the “sluggish cognitive tempo” (SCT) end of the spectrum? Does anyone know of strategies for improvement for those folks? like fear of someone or something at home or in school distracting them. i grew up as a teachers son in switzerland, we also had in every 1hour lesson a break for at least 10 min. from grad 1 -9 (9years mandatory) i never could understand way you want to pin down kids for over an hour, looking forward to retirement, i’m still not able to do that! on a side note, before i left my home country i thought a lot of youngster the skills of driving, one observation i made that most of them couldn’t concentrate for more than 15 min straight in heavy city traffic, for some a 5 min trip out of down town would give enough recovery time, some needed 15 min before it was safe to go back in the ‘jungle’. so whose idea was it to expect small children to sit still for a whole morning, if even adults struggle with 2 hours? No. They did NOT solve ADHD. They solved ants in the pants from kids being cooped up. They solved teachers violating ethics and laws who were playing psychiatrist and diagnosing ADHD when it didn’t exist. They in no way Beat ADHD by tripling recess time. BECAUSE IT IS IMPOSSIBLE TO DO THAT WAY. ADHD exists because of an imbalance of chemicals in the brain, not for any other reason. No amount of activity, no amount of punishment will alter that imbalance in any manner whatsoever. The only thing that does are the proper medication in the proper amounts for that person. Great they tripled recess and it solved the problems they created with their previous policies. Moving around is good for brain development lots of studies show that. And the ancient greeks understood that. But no they didn’t even begin to touch ADHD. So…what if exposure to natural light, which affects the chemicals in your brain, does help? How can you say it doesn’t begin to touch it? The truth is that you do not know what causes the imbalance and if it can or cannot be fixed, or if it can or cannot be improved. There is a great deal of research about ADHD and its probable causes. Does that mean some extra sunlight, as you suggest, might not help? I can’t say, because it hasn’t been researched. Which means this headline and the author’s tone about ADHD are, in fact, misleading, and convey a lack of understanding of ADHD as a condition. I entered 1st grade in 1952. I had an hour of recess everyday all the way up through 6th grade. In 7th grade we started changing classrooms like high school does. We had a 15 minute recess mid-morning, a 30 minute recess immediately after lunch and a 15 minute recess at the start of the last hour of the school day. All recess was outside unless weather made that impossible and the play was unstructured. We had playground equipment: 2 merry-go-rounds, 2 slides, 8 swings and 8 sea-saws. We ran and we played games like tag, red-rover and crack the whip. Children need this activity to burn off energy and to grow strong bones and muscles. No child should be forced to sit attentively for hours without a break and no child should be medicated to make them sit still. It is no surprise to me that the children who get this play time are doing better than those who do not. Former child, mother, grandmother and great grandmother. I know what kids need. Omg ADD/ADHD is not cured by more recess. ADHD kids will not be calmer just because they get more playtime. It’s a chemical imbalance. They also tend to be more impulsive and hot-tempered. Please quote interchanging “ADHD” and “hyperactive”. Might there not actually be so many kids with ADHD? Normal kids get Ritalin far too often. There is a great deal of research about ADHD and its probable causes. Does that mean some extra sunlight, as you suggest, might not help? I can’t say, because it hasn’t been researched. Which means this headline and the author’s tone about ADHD are, in fact, misleading, and convey a lack of understanding of ADHD as a condition. The school didn’t “beat ADHD.” It beat the number of incorrect ADHD diagnoses. That’s definitely a positive. But it isn’t what the headline points to. I totally love this “new” idea that worked so well when I was growing up! Having been a preschool teacher and now a Sunday School teacher, I still see the positives of letting/encouraging children to be creative and active. I see myself as a “facilitator” to provide learning opportunities. Decent article and would address kids who are misdiagnosed but would actually hurt the kids with ADHD. Tripling recess time to an hour and a half separated into six 15 minute “breaks” would add 10 extra transitions to the day which are extremely difficult for kids with ADHD and would basically turn their days into a WAY bigger struggle. However I do agree the extra time is necessary for all. Maybe 45 min in the morning and another 45 after lunch. The article itself is important but the title is slightly insulting to the kids who struggle with ADHD as it is a REAL issue and cannot be exercised away. I would say it depends! My son deals with ADHD but I think would benefit and be able to focus better if there were more breaks. However, his ability to deal with transitions has improved over the years. I realize not all do. This is good news. Waldorf schools have been aware of this since their inception in the early 1900’s. This should be common sense. What do adults do? It is pretty typical that every 50 minutes during professional trading you are given a 10 minute break. Why would it be any different with children? Can someone tell me if ADHD medicine actually cures ADHD or does it only manage symptoms? Do we know all the side effects? If it doesn’t cure ADHD, then why are some parents so focused on medicating their ADHD children? Why would they do more harm to their children in the long run for some short term perceived peace. You don’t obviously don’t understand ADHD. A child with ADHD untreated will feel stupid, struggle socially, and spend his whole life simply trying to stay on task. That is not kindness on the part of any parent. If a parent refuses to try medication for the reasons you’ve stated, they are doing a disservice to their child. Research the nearest Waldorf school for your kids. Increased recess and often no standardized testing produce a high number of kids who enjoy school and learning. Waldorf schools are not recommended for kids with real ADHD. My 3 kids and I have ADHD and we are in professional therapy for ADHD. All our docs told us not to send our kids to Waldorf schools it’s not structured enough. With ADHD structure is mandatory. I work in public schools and had said we need to stop treating children like “little adults.” They need time to play – play is learning. As an older adult with ADHD, I am interested in knowing what the implications of this study might be for people who’ve had 70-80 years experience living with this challenge. Being myself, I agree with more play time. However, I have noticed kids do not know how to play. Our play ground has a swing set, treehouse and slide, a jungle jumping thing and a box full of balls, jump ropes, cones, scooter, and a wagon. The kids are entertained for about 10 minutes then usually come over by me and flip on the grass explaining they are bored! I have to show them how to invent a game and use their imagination!! Our playtime ends sooner then I like simply because the boredom turns into mischief! This article is soooo… misleading. This is not about ADHD, it is about giving KINDERGARTEN AND FIRST GRADE STUDENTS extra time. Of course the youngest ones are figity and have shorter attention spans. That has nothing to do with ADHD, a real, medical issue caused by a chemical imbalance in the brain. Is recess vital for children to allow them to focus and release some of their energy? Yes. Beyond any doubt. Does recess cure ADHD? No, it does not! NOTHING cures ADHD! There is NO cure – only treatment. ADD (with or without Hyperactivity) is a physiologic-based psychological condition characterized, in part, by misfiring neurons in the brain. If a child is better able to focus during class after recess, they never had ADHD to start with! If a child really DOES have ADHD, all the running around in the world won’t cure that and will only help the child focus so much. REMEMBER: There are ADULTS with ADHD, too! This shows a genuine lack of understanding of what ADHD really is and is why so many people think ADHD is a fake condition and that no one really has ADHD. Before doing an article about ADHD, I suggest doing some research, first, on what ADD is – maybe pick up a copy of the APA’s Diagnostic and Statistical Manual of Mental Disorders (and BTW, the correct name, according the American Psychological Association – is ADD (with or without Hyperactivity). Thanks. I was just about to post a similar comment. Especially since the body of the article doesn’t even discuss ADHD? It’s not just a problematic headline – it’s harmful, in that it perpetuates attitudes about ADHD that result in it not being taken seriously (i.e., kids with “ADHD” just need to move their bodies more! = ADHD is just laziness and not a real neurological problem. ADHD is not just about kids who struggle in school. When it persists into adulthood, it makes people more prone to substance abuse, the outcome of which can be fatal. I support more unstructured play in school 100% and am excited to see it being instituted. My child starts Kindergarten in South Texas this fall and I hope her school follows suit. Everything about this article is wonderful except the headline and cavalier attitude about ADHD/Ritalin. thats great and all but really has nothing to do with ADHD. Kids with diagnosed ADHD still will have problems in the classrooms because they can’t focus long enough on one thing to finish a task. No amount of recess will help them focus on their school work. And before you start arguing my point do a little research by talking to a teacher or parent of a DIAGNOSED ADHD child. I fully concur. Retired teacher here. It is natural and necessary to allow children to play and interact socially. Not allowing for this, it is not surprising that it leads to problems. Let children be children. I am a retired physical education teacher. There were classroom teachers who would keep a kid from physical education as punishment for something done in the classroom. I would confront those teachers and ask them to find another way of disciplining besides using my class, which kids always seemed to enjoy. If their kid misbehaved in p.e. I dealt with it then and there. In my class. At times I asked the principal to announce at faculty meetings that physical education was not to be used as a punishment for classroom and most of them did. I got a reputation, for sure, but believed in what I was providing for that child. Are we finally getting smart? I hope this spreads and others take heed! Even kids w/o ADD need this. I’m 70 yrs old and endured Catholic school as a very little girl until 8th grade. I am reasonably sure that, if ADD were diagnosed back then, I would have been among those who had it. I specifically remember being unable to stay in my chair. The nuns were anything but kind. In retrospect, for a kid 6 or 7 yrs. old, I believe the structure, being crammed into a hot classroom with 50 other kids in close proximity for 3 to 4 hours. was torture. And we were allowed to go home at lunchtime back then in the 50s! Something used to work that doesn’t work anymore. We need to stop fixing our kids and start undoing the fixes/remedies that have gone run amok with never ending circular results. Get the kids off of drugs. Let them be kids again. Discipline their bottoms with a stinger once in a while (when necessary) and leave ALL religions OUT of schools – including the religion of Evolutionism – and leave those teachings to home, church and family where they Constitutionally belong! Isn’t disciplining their bottoms with a stinger a Fifty Shades of Grey thing? Leave that in the bedroom between consenting adults. I would love for my students to have 15 min. of recess for every 45 minutes of instruction. Kids need to be active! I often take them out for additional short breaks when I can. But teachers and schools are not the villains in this scenario. The core of this problem is that our nation is so focused on mandating, controlling, and assessing every little thing in schools, and disrespect for and blaming of those who have chosen education as our life’s work is rampant. We are now reaping the consequences of this societal backlash against public education. Give us the tools we need, trust us to do our work, impress upon the students that their families and communities expect positive behavior and hard work, and you will see wonderful results. I’ve been screaming for years that kids need more recess time. We also need to stop using it as in-school “finish your work time” while everyone else gets to go out and play. When I subbed I often ignored the teacher’s instructions that little Johnny or Susie needed to stay in and finish his or her(insert subject) work so they could go out and burn off some energy and take a mental health break. They also need the socialization that you get from group play. This sound very much like what it was like when I was in elementary school in the 50’s. We had 2 or 3 recesses. They were unstructured, we jumped rope, play play yard games (kids don’t learn those much anymore). We also didn’t have all the testing that kids have to do today. They absolutely need to have more recess time outside. Just imagine! LESS time in class and MORE free time leads to BETTER outcomes. Been saying this for years. At least the Finns have it figured out! Only had one recess, but we had PE everyday. If in any class we got wiggly teachers would call out its time for 30 seconds of movement. We’d all stand up and teachers would play a very active Simon Says — jog, hop, touch your toes, etc.. Some teachers started class with a get your wiggles out minute doing the same thing. It was fun and silly and worked. Sure there was still a kid or two that struggled sitting still but usually the teacher would move that child the reading rug and have them continue their work with a little more room and not in the middle of the settled kids. Don’t tell me it takes time to organize the kids and get them in and out. In Central NY we had to get in out of snow boots, snowsuits, hats and mittens. Yet we still managed to get out, play and back in. School started at 8AM, home at 3PM. We implement this at our school and it’s not working. Students are performing lower in all academic areas. There’s a lot of wasted time in transitions and accidents which happen during recess. Lots of parent complaints about their children being bullied on the playground. It looks great in theory but once you implement it, it drives you crazy as a teacher. 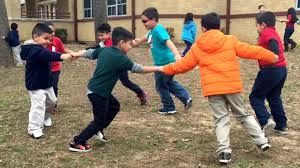 Students are finally settled an engaged when its time to go out to recess again. I have two kids with ADHD and have not seen a difference. Please don’t implement in your schools it will give you nightmares! Amazing that it takes people to go “discover” techniques that actually were a part of our schools in the 50s to the 70s. We should be taking our schools back to teaching reading, writing, and arithmetic the “old” way and perhaps find that our students would be better equipped to face higher learning than they are today!